The incursion and bombardment of Gaza is not about destroying Hamas. It is not about stopping rocket fire into Israel, it is not about achieving peace. The Israeli decision to rain death and destruction on Gaza, to use lethal weapons of the modern battlefield on a largely defenseless civilian population, is the final phase in a decades-long campaign to ethnically-cleanse Palestinians.Israel uses sophisticated attack jets and naval vessels to bomb densely-crowded refugee camps, schools, apartment blocks, mosques, and slums to attack a population that has no air force, no air defense, no navy, no heavy weapons, no artillery units, no mechanized armor, no command in control, no army… and calls it a war. It is not a war, it is murder. When Israelis in the occupied territories now claim that they have to defend themselves, they are defending themselves in the sense that any military occupier has to defend itself against the population they are crushing. You can’t defend yourself when you’re militarily occupying someone else’s land. That’s not defense. Call it what you like, it’s not defense. The incursion and bombardment of Gaza is not about destroying Hamas. It is not about stopping rocket fire into Israel. It is not about achieving peace. The Israeli decision to rain death and destruction on Gaza, to use lethal weapons of the modern battle field on a largely defenseless civilian population is the final phase in the decades long campaign to ethnically cleanse Palestinians. Prof. Noam Chomsky: When Israel, in the occupied territories now, claim that they have to defend themselves, they are defending themselves in the sense that any military occupier has to defend itself against the population that they’re crushing. You might ask: does any of this matter? There’s little to argue with in the hybrid statement itself; the intentions of everyone – or at least almost everyone – involved might be assumed to be good. We think there are three key reasons why it does matter. First, there is a worrying tendency in well-intentioned activism to forget about authenticity when you essentially agree with the sentiment expressed. But authenticity does matter, it always matters, and what might seem like a quibble over phrasing could have a major impact in the long run. It’s worth remembering – especially on the Israel-Palestine issue – how much obfuscation is caused by people (often paid journalists working in newsrooms) selectively picking information and not bothering to assess the evidence in a balanced, historically accurate way. For those determined to scant Israel’s ethnic cleansing such quotations-fudging has reached stratospheric proportions. Misquotation and inaccuracy are weapons of the propagandist, not the peace activist. Second, reams of historical apocrypha have been created by the passing on of quotations which seem accurate. Though this may sometimes be amusing – and create work for future historians – it also muddies the historical waters, causing confusion – especially when a statement is repeated so much it becomes impossible to tell whether the person really said it. (Recall, to take just one example Ahmedinejad’s quotation of Khomeini, which was – probably deliberately – mistranslated into a line about “wiping Israel off the map” and is now a staple of doctrine, despite being utterly inaccurate.) We should guard against this as a matter of principle, whoever is being quoted, whatever argument we are advancing. Third, the mistake seems especially crude in this case because – of all people – the person misquoted is a) something of a stickler for accuracy in quotation, b) someone who has written extensively, diligently and at enormous length on this very topic for decades. How much effort does it take, with a back catalogue like Chomsky’s, to find something to quote accurately? The US-Israeli assault on Gaza escalated in January 2006, a few months after the formal withdrawal, when Palestinians committed a truly heinous crime: they voted “the wrong way” in a free election. Like others, Palestinians learned that one does not disobey with impunity the commands of the master, who never cease to orate about his “yearning for democracy” without eliciting ridicule from the educated classes, another impressive achievement. Since the terms “aggression” and “terrorism” are inadequate, some new term is needed for the sadistic and cowardly torture of people caged with no possibility of escape, while they are being pounded to dust by the most sophisticated products of US military technology – used in violation of international and even US law, but for self-declared outlaw states that is just another minor technicality. Excellent sleuthing. And MediaLens: “radical churnalism” is a great term for a real problem! I have posted this article and an apology to everybody for not seeing the red flag in this situation. I thought the words were particularly stringent for Noam, I was thinking it did sound familiar, too. Thank you for uncovering this as a misquote. Thanks for the source checking but greater thanks for the eloquent defense of honesty and accuracy in citing sources. It does matter! Thank you for correcting the misquote of Chomsky. Even though, still what Israel doing now is a real massacre of innocent Palestinian’s children, and this clearly is not exhibited by your second quote. If we are to claim to be peace activists, we have to know first who is the oppressor and the oppressed, and surely Israel is the oppressive state that kills and ruins Palestinian homes with no right.. share please! “The original source for this statement appears to have been “salem-news.com“, whose editor adopted etc” – I think he is right; Prof Chomsky is alive, and he is the only person who is entitled to rule what is his and what is not. Until you (or somebody else) produce a letter from Chomsky to such effect – the quote stands. OK – we’ve cleared up the question of quotes or misquotes. This does not, however, make things any clearer to those of us who feel 1) there is a terrible imbalance between Israel and Gaza in ability to protect itself and 2) why is it OK for Israel to continue building on Palestinian territory and to build a wall so that Palestinians cannot either get supplies in or get out to go to work. This whole situation can be compared to forcing two rival gangs to live in close proximity in a city. It’s never going to work. How many innocent lives have to be lost before a better solution is found? So now I’m wondering about the agenda of the Huff Post. Just who is misleading who here? Here is a new quote that is being shared all over my Facebook, can it be confirmed that it is not a another misquote? In an op-ed in The New York Times in March 2012, Beinart recommends what he calls “Zionist B.D.S.” — a boycott of goods made in the Israeli settlements combined with renewed support for Israel within the Green Line, including East Jerusalem. The phrase “nondemocratic Israel” for the occupied territories “suggests there are today two Israels: a flawed but genuine democracy within the green line and an ethnically-based nondemocracy beyond it. It counters efforts by Israel’s leaders to use the legitimacy of democratic Israel to legitimize the occupation and by Israel’s adversaries to use the illegitimacy of the occupation to delegitimize democratic Israel”. And he concludes: “If Israel makes the occupation permanent and Zionism ceases to be a democratic project, Israel’s foes will eventually overthrow Zionism itself. We are closer to that day than many American Jews want to admit. Sticking to the old comfortable ways endangers Israel’s democratic future. If we want to effectively oppose the forces that threaten Israel from without, we must also oppose the forces that threaten it from within”. When you care about appropriate quotation (correctly) you should also care about links. The one to the Official Chomsky site does not work, and this is quite a serious omission. Einar – the quote you’ve shared is also by Hedges, not Chomsky. It’s part of the same piece that has been misattributed. Mark – thanks for alerting us to that. We’ve fixed the link. The result of the Gazan election was no more “wrong” than was the result of the series of elections that led to the Nazi party taking power in Germany in the 1930s. Having said that, it is possible that they commanded a significant number of the vote through murder, thuggery and intimidation. A further parallel to 1930s Germany. What is of concern is that an elected government can also take a people on a perilous journey. A journey that can lead to their suffering or indeed destruction. This dispute endures because of a religious dispute. Islam cannot tolerate that a previously Muslim land can be governed by a non-Muslim government. For them it must be part of the “House of War”. Its very existence is a grave wound to the Pan-Arabic Muslim Community, the Ummah, which cannot be expunged without Israel being re-conquered. I believe that the roots of this dispute run too deep to allow a peaceful co-habitation. I fear that the only lasting peace will come from retrying the same solutions that brought comparative peace to India v Pakistan and Greece v Turkey. ^ Remind me, how many settlements has India built in Pakistan since the partition agreement? Human reason and great minds achieve wonders. However, even great minds like Chomsky are reduced to absurdity when they neglect a key element of the problem they are addressing. Chomsky consistently neglects one key element in the Palestinian problem, namely their genocidal beliefs and orientation toward Jews and toward Israel. Their “best sellers” are Mein Kampf, and “The Protocols of the Elders of Zion”, erroneous and hateful documents that try to prove that Jews seek to promote wars, and to control the world, and drain it of its goods and wealth. Palestinians also widely believe in the “blood libel”: which states that Jews kill Muslim children to draw their blood, supposedly necessary for Jewish religious rituals – an old slander used by Jew haters to foment many slaughters. Genocide means the killing of a whole people (as in Rwanda and in Nazi Germany). This is what Palestinian schools teach their little children. This is not prejudice or mere hatred. It is the belief that a certain people is evil and must be killed off. Hitler and Goebbels taught this as a prelude to the death camps. Many Arabs, and most Palestinians also hold these beliefs. Arab leaders try to minimize these genocidal attitudes by stating they are merely a strong reaction to Israeli occupation. However, these attitudes were also prevalent before 1947 when the UN divided the area into a Jewish state and a Palestinian state. When Hamas rains bombs on Israeli civilian areas, they are not reacting to an Israeli occupation, but rather, to their wish to destroy Israel and its Jewish occupants, as clearly stated in their charter.and “Constitution”. Chomsky totally overlooks this, and thus his great intellect leads him to foolish conclusions. He has had ample time to study the whole situation , and to take into account the genocidal orientation of the people he describes as an “abused minority”. 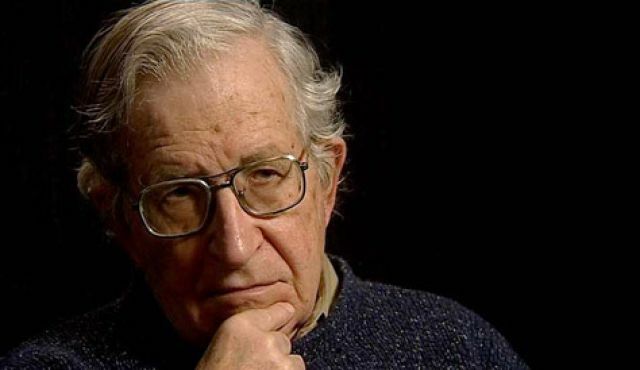 Chomsky has no intellectual deficit, so we must conclude that the problem touches some emotional depths that prevent him from taking a broad view of the phenomena under consideration, as when confronting a challenge to his theory of linguistics. Nazi Germany dominated the radio news waves to Arab countries, and for ten years, broadcast genocidal lies about Jews, hoping to win the Arabs as allies in a Rommel assault on the Middle East. Gen. Montgomery defeated Rommel in North Africa, and blocked the Nazi conquest of Arab lands. However, the propaganda barrage of genocidal ideas suited the Arabs in their attempt to prevent the formation of a Jewish state…The genius, Chomsky, does not seem to know this history, and holds to his foolish judgments about Israel and the Palestinians. With an issue as multi-faceted and complicated as this, individuals with the confidence to be righteously indignant ought to recognize that something is missing. If you do not allow yourself to see the other side of this issue, you are not considering the whole issue. Opinions on this topic are so heated that people censor their own reading and refuse to look deeper. It is scary that Israel has no problem doing what Nazi Germany did to them. Obviously not to the extent that the Nazi did but also committing war crimes. What they are doing is genocide. Burying homes and people, bombing schools and refugee camps and keeping a whole population deprived is atrocious. To have gone through something as atrocious as the Holocaust and then to put another human being through the same is heinous and a crime against humanity. “To have gone through something as atrocious as the Holocaust and then to put another human being through the same is heinous and a crime against humanity” < < < I'm no fan of Islamofascists and won't be caught dead to defend them, but you're right to make this observation, and it's clear evidence of the hypocrisy of the Jew, and the moral bankruptcy of Zionism. I am curious, due to the relatively recent discoveries of Chris Hedges’ plagiarism, if in fact the entire quote is indeed Chomsky’s? It would be an interesting project to research this more deeply. Especially in light of the recent Israeli assault of Gaza, Chomsky/Hedges is absolutely correct. What stupid cherry-picking when innocent civilians are being murdered as we talk.